Peruchazhi is not up to the mark especially since it underutilises an actor of Mohanlal's caliber, says nParesh C Palicha. What do you make of a film that begins with a request to switch off your mobile phones, and then tells you to keep logic outside the theatre? Confusing. Since the first half of the request suggests the film deserves serious viewing and the second half tells you to have fun without employing your intellect. After nearly three hours of viewing, you realise that if you had left your mobile phone on you wouldn’t have missed anything in Peruchazhi, Mohanlal's Onam gift to his fans. This film is directed by Arun Vaidyanathan. It can easily pass off as a television programme, a tribute to the long innings of Mohanlal, one of the most mesmerising actors to grace the Indian screen. Mohanlal plays Jagannathan, a sportsman in the past. He now plays cricket with school kids and advises politicians and ministers on State policy. This makes his friend Francis (Mukesh), who is a minister, feel insecure, as he may lose his position to Jagannathan. So Francis dispatches him to the USA to help his nephew Sunny Kurishingal (Vijay Babu), who is working as the campaign manager of an American politician who is contesting elections to be the governor of California. Jagannathan employs strategies used by Indian politicians to win elections. He divides society on racial lines, promises freebies and even manages an item song. Everything is underscored by humour and to enhance the comic situations, Mohanlal is provided two assistants - Baburaj and Aju Varghese. Every comic sequence is punctuated by a reference to one of Mohanlal's films or lines from one of those films. This strategy becomes cumbersome after a while. 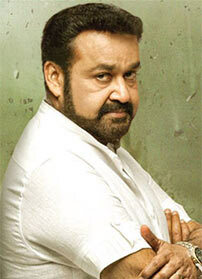 Mohanlal looks dapper with a stylishly trimmed beard, but his acting potential is sparingly utilised. Baburaj is as usual stupidity personified. Aju Varghese tries his best to match up to both of them but he still has miles to go to reach their standard. Peruchazhi is not up to the mark especially since it underutilises an actor of the calibre of Mohanlal. Does it look like she cares?